You're looking at an actor whose price has just doubled. He attended A B Davis High School. He also narrated a version of The Wizard of Oz for Golden Records with Mitch Miller and his chorus performing four of the songs from the classic 1939 film version. Carney was drafted as an infantryman during World War II. 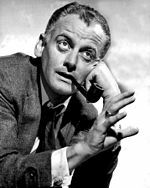 Arthur William Matthew “Art” Carney (November 4 1918 – November 9 2003) was an American actor in film stage television and radio.